The original Ticket to Ride was hailed as the ultimate gateway game, that is, the perfect way to introduce new gamers to the world beyond Monopoly. Did it fulfill this promise? Yes, at the sacrifice of complexity. The new edition is without question a meatier game. The map is tighter, there's a new mechanism for distributing the bonus route cards, and the tunnels add a nice element of randomness. This added complexity significantly increases the game's replayability yet it's still simple enough to teach to just about anyone. Like Settlers and Carcassone, this is a must have for any game collection. Best of the Ticket to Ride Games! Much better than the base Ticket to Ride Game which has only one basic winning strategy, the one who gets the most 6 train routes wins 90% of the time in the base ticket to ride game. Game has several extra mechanics like train stations and tunnels that are easy to learn. This is the ticket to ride game to buy if you are new to the game! A great family game! Easy to learn and fun to play. Just the right combination of luck and strategy. Having played the original US map and now owning the Europe map version, I can say that the Europe map is the better of the two. There is more strategy involved- more competition for routes. It is best with 4-5 players as 2-3 players does not offer enough competition for routes. A personal favorite among the Ticket to Ride series of games. The game offers a very tight competitive map that can get crowded very quickly. However train stations can always be used to bail yourself out of a difficult situation. I also like the separation of long tickets and short tickets. The best of the TTR games, in my opinion. This game rocks. Easy to learn rules. Fun game. Most people can play this game. 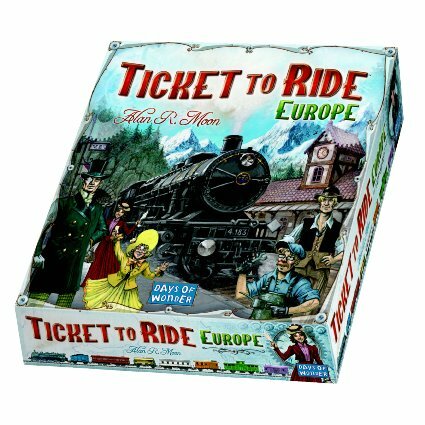 It's Ticket to Ride with a European flair and a couple of additional rules for a twist to the original. Try it out with the 1912 expansion. That just makes it more fun! This game is quickly becoming a classic. In this set collection card driven game you are competing to complete the most train routes. One nice feature of Days of Wonder games is that they include information and keys to the online game you can play via their website. Every gamer should own one variation of Ticket To Ride. My in-laws enjoyed this game so much in Russia that I bought 2 more copies for them. This is a intuitive and playable game for virtually anyone, but it retains enough complexity - especially with the added Europe rules - for serious gamers alike. A very well-made and playable game. I also recommend downloading and printing fan-designed maps promoted by Days of Wonder via their website. I chose to get this TTR game first because of the tunnels, ferries, and train stations. The tunnels make you get some backup cards in case the price goes up. The ferries make locomotives more valuable. The train stations give people a way out if they have been blocked in. That makes it a little more friendly for gateway gamers. Fun times! This is my favorite Ticket to ride. With the added addition of complexity it allows the game to be accessible to multiple levels of skill rather than just for new gamers. My wife picked this game out, and so far its been (mostly) a blast. The only thing that she isn't a fan of is the blocking aspect (we weren't playing with train stations). So yeah, as long as you don't want to put your marriage in jeopardy by playing mean, this is going to be a hit! Big improvement over the original Ticket To Ride, as it adds several new elements and possibilites for using cities for more than one route. Great for families and casual players, as it is easy to learn and play. Nice twists to an already great game. You are able to actually use someone else's train. A few other tweeks make it fun and we had to add this to our already basic game. This Europe Ticket to Ride and the USA have been well, well played board games and a great way to introduce friends and family to Euro-style gaming. What a great value for your entertainment dollar! Better with the 1912 card /depots expansion, but nice on its own. A little more competitive for tickets than TTR: USA, and also includes Stations in case someone steals your route(s). Love TTR: Europe! I play this at work with my coworkers at lunch - it's just the right complexity to be interesting, without being too cutthroat or intense to play over lunch with people I have to work with. The stations make this a more congenial game than the base set or other flavors. Mirrors the original but adds a couple new gameplay elements. The addition of stations makes it a little easier to complete tickets and the addition of tunnels adds a little more randomness to the game. If you enjoyed building rails across America, get ready to try Europe! (I suppose if you don't want to build rails across America, this is also a good idea.) This game changes very little from the base game, and it's standalone to boot! Over the last year this has developed to be one of my favorite games. Quick to play, easy to learn but yet enough strategy to keep everyone guessing until the end as to who is actually going to win. Quality of game is first rate. Beautifully illustrated. Extremelty fun and addictive this game is only slightly more complex than the American version but more fun and strategic because of it, if you liked the American one this one i assure you is even better! Ticket to Ride is a group favorite. My dad plays, my wife plays, we introduce it to new friends. Europe is markedly better than the USA map, because there is more variability and less route monopolizing from one game to the next. Not too hard, but still strategic. One of our major loves of this game is the short turn cycle, you're almost always doing something.